Yahtzee is a popular family dice game played with five dice. It is a commercial version of the traditional game of Yacht. Yahtzee is played by two or more people, and uses five six-sided dice. A dice cup is often used as well, though this is optional. Players take turns rolling the dice and attempting to score the maximum number of points by rolling specific combinations of dice. For each player's turn, they are allowed to roll the dice up to three times in an attempt to get the highest scoring combination. For the first roll, throw all five dice. From among the five, set aside any you wish to keep, and pick up the rest and roll again. Repeat once more if you like. At the end of the three rolls (or sooner if you prefer), you must fill in one of the blank category spaces on the score sheet, either with a point value that you've earned, based on the combination rolled, or a zero if you're unable to make an available combination. Here are some free printable Yahtzee score sheets from dice-play.com. Note that the columns on the score sheet can be used for either multiple players per sheet, or multiple games with one sheet per player. Additional Yahtzee score sheets styles available from here and here. You can also create your own by hand. The game continues until all 13 available spaces are filled in, either with a score or with a zero. The scoring is divided into upper and lower sections. The upper section is used to roll 1's, 2's, 3's, 4's, 5's, and 6's. Only the dice with the specified value are totaled in each category; the rest are ignored. For instance, in the first example shown above, you rolled a 1-1-1-4-5. Since you chose to use the 1's category, you count only the three 1's, for a total of 4 points. You also could have chosen to write down a "4" in the 4's category, or a "5" in the 5's category. In the lower section, you score either the sum total of all the dice (for three-of-a-kind, four-of-a-kind, and chance), or a fixed amount (for the full house, small straight, large straight, and yahtzee). The final score is the sum of the upper section, bonus, and lower section. The winner is the player with the highest score! Some score sheets provide spaces for Yahtzee bonuses, in which 100 points is awarded for each Yahtzee (5-of-a-kind) you score beyond the first. Triple Yahtzee plays by the same rules as regular Yahtzee, except that each player uses three columns during a game. Totals are doubled in column two, and tripled in column three, and your grand total is the sum of all three columns. This opens up the strategy a bit, by allowing for more latitude on where to record your points for optimum scores. Power Yahtzee adds a sixth dice called a "power die", which affects scoring in one of six ways: "1" multiplies your score for that round by one (i.e. does not change it); "2" multiplies your score by two; "3" multiplies your score by three; "Freeze" eliminates any further rolls that round; "Double" multiplies your score by two, and allows you to score the roll in two categories at once; "Power" multiplies your score by three and gives you the option of a fourth roll. Crag, Yacht, and Kismet are distinct games that share many characteristics with Yahtzee. The maximum Yahtzee score is 375 points. If playing with Yahtzee bonuses, the maximum score is 1575 points (though the probability is about 1 in 283 quadrillion (15 zeros)). Yahtzee was first marketed by the E.S. Lowe Company in 1956. Milton Bradley took over the game in 1973, and it is currently owned by Hasbro. The original Yahtzee logo includes a caricature of E. S. Lowe as a professor. 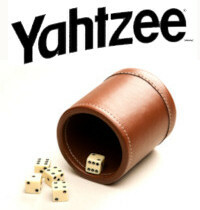 Hasbro claims that as many as 100 million people worldwide regularly play the game of Yahtzee. More than 50 million Yahtzee games are sold annually. To learn more about the game of Yahtzee, consult one of the following web sites, which provide additional rule and strategy guides. Official rules for the game of Yahtzee, as included with Hasbbro editions of the game. Hasbro also has rules for other editions of Yahtzee. A Yahtzee reference site from the UK, with "everything about the dice game Yahtzee - rules, high scores and probability and more". Information about the game of Yahtzee, from the free online encyclopedia, with rules, variations, and probabilities.